Leaked UN climate report warns of dangerous global warming. Will the world listen? That shifts the debate onto the extent of temperature rises and the likely impacts, from manageable to catastrophic. For those familiar with global warming science, there isn't much new here. We've long known that manmade activity was likely the leading cause of our current warming and climate change. But the AR5 is newsworthy because of the new level of agreement among experts: 95 percent certainty. The new report will describe how climate changes are continuing without abatement. In particular, temperatures are rising, oceans are heating, waters are rising, ice is melting, the oceans are acidifying, heat is even moving to the deepest parts of the oceans. Just as importantly, the report will show that these changes are largely human-caused. Some items are worse than we thought. In the last report, ice loss, particularly from Greenland, was a minor issue. Now, it is clear that not only Greenland, but also Antarctica are melting and this melt is raising sea levels. Furthermore, Arctic sea ice is being lost faster than previously reported. the IPCC has done its job. For this fifth report, they have synthesized the science and provided enough evidence that action is warranted. How many more reports of this type do we need? Will a sixth report that confirms what we already know make much of a difference? Will a seventh? Do these reports need to be written every 5-6 years? Perhaps one a decade would be sufficient? These reports require enormous amounts of time and energy. Scientists who take authorship roles put their own research on hold, sometimes for years. Whatever the future holds for the IPCC, the history books will tell us we were warned. Indeed we have been. Will it be enough to inspire the global community to act? IMAGE: It's not a hockey stick, it's a scythe. 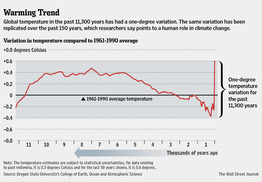 Chart shows that finds that Earth is on track to become warmer than it has been in 11.3 millennia. The United Nations' Intergovernmental Panel on Climate Change (IPCC) was expected to delivery its fifth Assessment Report (AR5) next month, but over the past weekend, a draft of that report was leaked to Reuters, which reported the early findings.